Following the research project “OwnReality. To Each His Own Reality”, the cycle of workshops on the subject of the “Art History Authorities”, and the programme “Travelling Art Histories”, the German Center for Art History is continuing its research into relations in art in a long-term series of workshops. After studying the subject of art criticism in France, the FRG, the GDR and Poland between 1960 and 1989, the historiographical issues that resulted from the Cold War, and the postcolonial problems of transregional encounters, we wish now to explore how artistic practices of all kinds have contributed to the manner in which relations have been viewed during modernity, i.e. since the 18th century. The study of modernity is marked by solid disciplinary, geographical and epistemological divisions subdivided into classifications, categories and typologies. Such structuring entails hierarchies governed by orders and norms. However, the elements arising from these divisions are also constantly linked through consideration of their relations and questioning of the divisions that exist between nature and culture, nation and race, form and substance, body and spirit, time and space, subject and object. These questions are the outcome of different conceptions of these relations, whether they are linear, tree-structured, rhizome-like, bundled or in Baudelarian correspondences. The discipline of art history took shape within this conjuncture and in turn ordered the arts by period, national school, technique, style, genre, artist and place; determining canons and critical moments; establishing links through relations marked by influence, channels of inspiration, and phenomena arising from transfer and interference. Such classifications impinge on the narratives advanced by the discipline itself, art criticism and museums. Supported by critical debates generated by deconstruction, and by studies on the construction of arguments and representations, research studies are questioning the divisions that have structured the human and social sciences. They are distinguished by the use of the prefixes “post-” and “trans-”, and by the sequence of critical moments, among which appearance and disappearance regularly punctuate the field of knowledge and the development of ideas. The questions of division and relationship are always at issue in analyses of art history as a matter of course, yet it is very unusual that artistic practices are involved. They reflect, interpret and disrupt the socio-cultural context and/or are detached, independent or autonomous from it. Depending on the conceptions, it is the value of the artistic practices or the importance of the context that is put forward and the proposal then structures the links between society, art and discourse differently. As it does not seem possible for these conceptions to hold together, a questioning strain develops. The unique nature of artistic practices, however, offers a way to reconsider relations since the question no longer arises of deciding between the perspectives of a positivist scientific discourse and the sanctification of art. How can we think about relations with artistic practices constructively? How are we to treat the questions addressed by these practices to the discourse that tries to comprehend them? These relations constantly question what artistic practices do with and to reality. It is by focusing on these aspects that we wish to encourage meetings and question what artistic practices bring to the analysis of relations. The term “relation” covers a variety of phenomena associated with circulation, dissemination and reception, re-established on the basis of documents, archive records and statistics, without the questions raised by the encounters that they entail being necessarily addressed. So that the relations are neither consensual nor diminished to a factual approach, we would like to explore more specifically what occurs during these encounters, and to study what they prompt in terms of cohesion, division, indifference, inequality, conflict, edification and other themes. With this in mind, we would like to bring together individuals from different environments and traditions so that they might precisely describe the relations they analyse based on the artistic practices that will be at the heart of the workshops. The presentations will explore artistic practices that relate to or address in themselves the relations and divisions posed by modernity, paying attention to the manner in which these practices confront reality. Methodological issues will always be at the centre of attention and analysed in all their detail, in order to refine each one. Distinct from all relativism, the purpose is much more about gathering points of view from researchers of different academic background, and about becoming aware of the individual trajectory on the basis of which we all form our point of view. Only by pooling our thinking will we be able to grasp the particular manner with which artistic practices address the question of relations. It is essential that artistic practices are at the heart of the analysis. To ensure that the presentations are fully able to explore the question of relations, participants are asked to send a summary of their proposed paper, or book introductions, that clarify the context of the subject to be discussed: issues relating to the reception given to an artist, context cultural, intellectual context, etc. Our primary purpose is to create an opportunity for reflection on relations arising from artistic practices. How to rethink the question of the autonomy of art in a critical perspective? Does art participate in forging society? What are the interdependences of thoughts on art, politics and economics? How can the return of the past be conceived as a means of resowing the present and in return how can recent practices shed light on those of the past? Is the relationship through time conceived in a linear, continuous, iterative way? 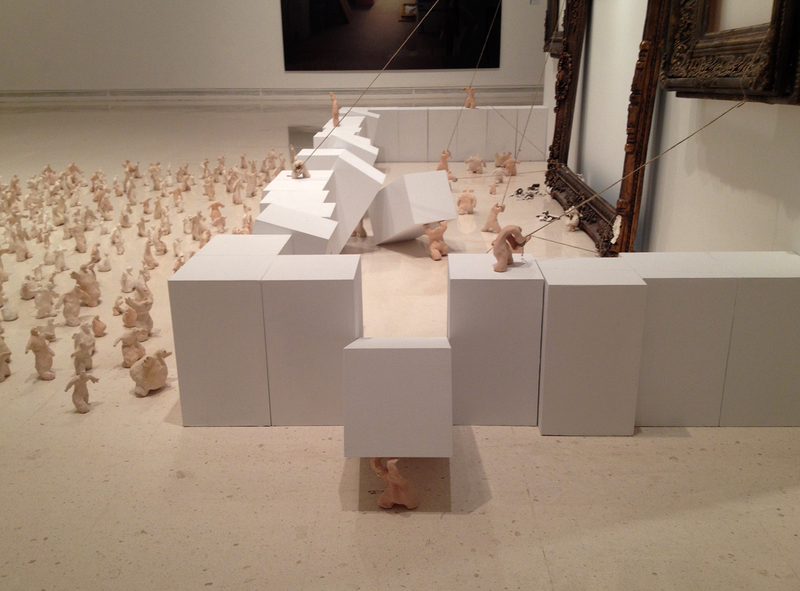 Bassem Yousri, It’s Not As Easy As It May Have Seemed to Be, 2012, installed at IVAM, Valencia, Spain, 2013. Photo © Bassem Yousri, 2013, courtesy of the artist.